MainAll NewsDefense/Middle EastReturn of Cast Lead? The IDF attacked Hamas terrorists on Tuesday for the first time since Operation Cast Lead two years ago, according to IDF Chief of Staff Gabi Ashkenazi. The IDF frequently has strafed Hamas weapons facilities, tunnels and terrorists who were “ticking bombs” but avoided bombing Hamas outposts until Tuesday. After overnight strikes on structures and bunkers housing Hamas terrorists, The Air Force late Tuesday afternoon bombed a Hamas outpost in Rafiah, located in southern Gaza and at the Egyptian border. 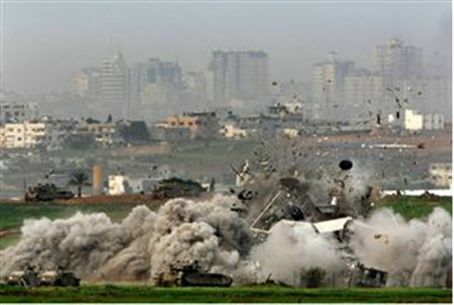 Military spokesmen said the strike was a “direct hit” on the bunker, and Hamas reported four terrorists were wounded. The IDF’s strike on the Hamas position at Rafiah was in retaliation for Tuesday morning’s missile attack that lightly injured a young girl near a kindergarten on a kibbutz farm. The rocket was the 15th projectile to be fired on Israel since Monday morning. He said that soldiers operate as close as a few yards from the separation security fence to prevent terrorists from reaching Israel communities in the Western Negev. The Chief of Staff also said that the Iron Dome missile defense system will be operative next year, but experts outside the Defense Ministry headed by Ehud Barak question its effectiveness to protect civilians. The system new was not meant for defending towns and villages, but military bases, according to the website Strategy Page. Barak has spent years campaigning for American aid for the Iron Dome system, but Strategy Page points out, “It turns out that it takes about 15 seconds for Iron Dome to detect, identify and fire its missiles. But most of the civilian targets currently under fire from Gaza are so close to the border that the rockets are fired and land in less than 15 seconds. As previously reported, the American-made Centurion has been successful in shooting down mortar shells and short range rockets in Iraq and Afghanistan, Strategy Page added, but Barak has rejected it.